WELLINGTON, New Zealand, Jan. 18, 2019 /PRNewswire/ -- Since 2016, Meridian Energy have been the National Partner of the Department of Conservation's Kakapo Recovery Programme (KRP) in their efforts to revive this critically endangered native parrot, but what most people don't know is that there are only 147 left. As a 100% renewable energy generator, Meridian is incredibly focused on taking care of New Zealand's natural environment and the precious species that inhabit it, including supporting the recovery effort through science, technology and state-of-the-art Smart Eggs that help the incubation process. Michael Healy, Meridian's Chief Marketing Officer, says, "The trouble is, these are only good once breeding kicks off. Meridian decided some creativity might be needed to give these treasured native parrots with troublesome breeding a helping hand. And by hand, we mean saxophone". So, Meridian has put a call out to New Zealand to find a talented saxophonist to help save a species with what is widely recognised as the smoothest, most romantic instrument out there. "We're aware the science behind saxophones and kakapo breeding is as yet untested. But with only 147 of these amazing birds left, at Meridian we'll try anything," says Healy. The winning saxophonist, whether they're a gifted local or the legend Kenny G himself, will professionally record a song for the kakapo that will be available for download on the Meridian Energy website and handed over to the Kakapo Rangers. "The response to the campaign to date has been great, and we've received some great entries from keen sax players all over the country. 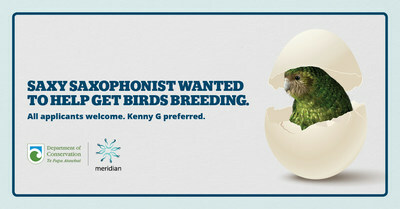 We're still hoping that to attract the main man himself, Kenny G, but we've also got some great local talent who can help these precious birds out." "Most importantly though, we're really aiming to make sure everyone is aware of the fact there are so few of these birds left -- so it's a privilege to be helping raise more awareness of the plight of the kakapo", says Healy. As New Zealand's largest 100% renewable energy generator, and as a retailer, Meridian has always walked hand in hand with the environment.